We set out today searching for fish. As we rowed on the water, we checked the first weed bed for pumpkinseed. It didn’t take us long to realize that the fish had moved off. The weather has been very warm and dry for quite a while now but the water level on this specific body of water has not dropped. 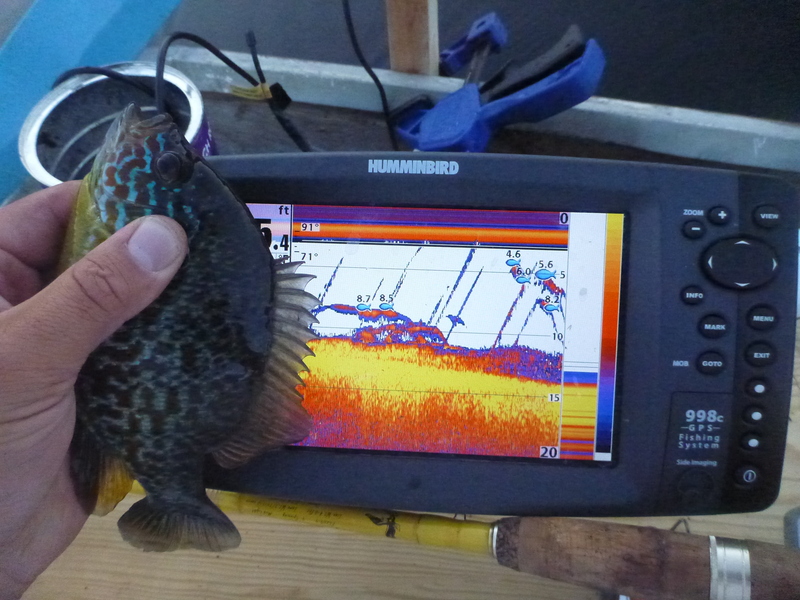 With the Humminbird 99c SI rigged up portable, we set off looking for structure. As we rowed around we found some good deep water weed mats on a 15-18 foot flat that were holding fish. 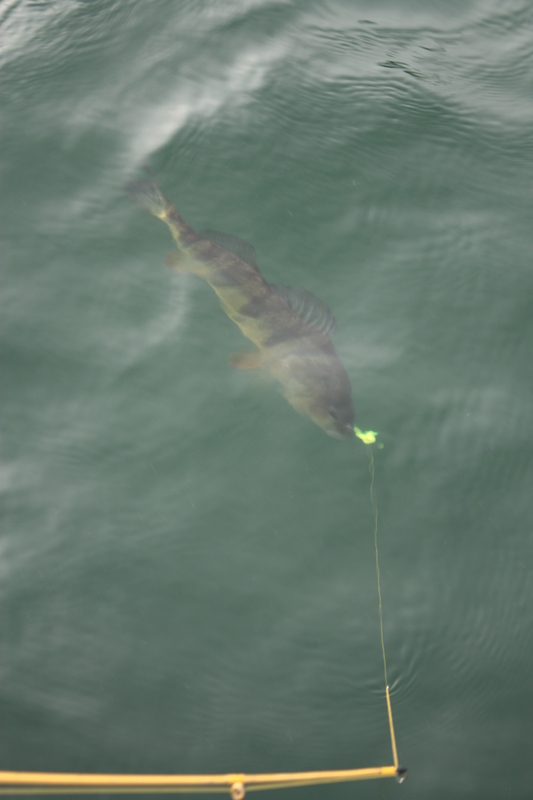 We began dropping our baits down, finding the fish between 5-6 feet below the surface of the water. 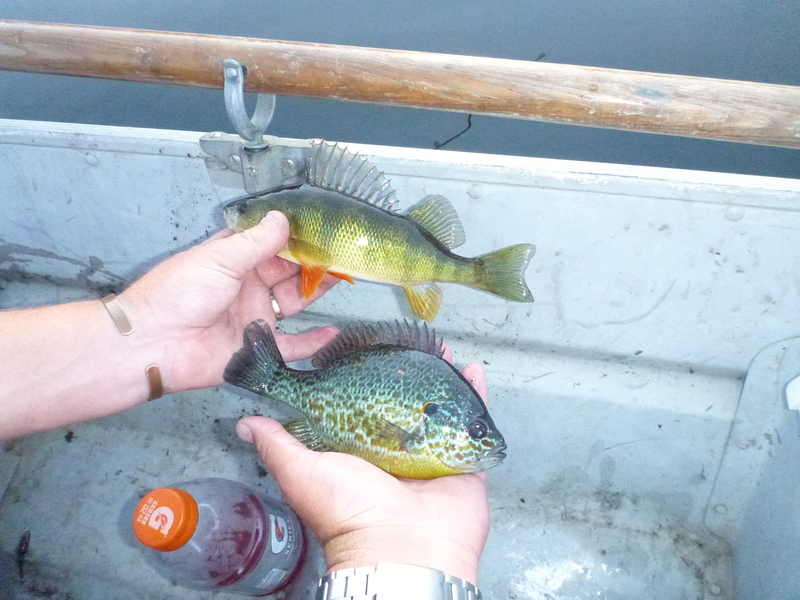 The fish were active and there was a good concentration of perch and pumpkinseed. We started off fishing without bobbers over the side of the boat. 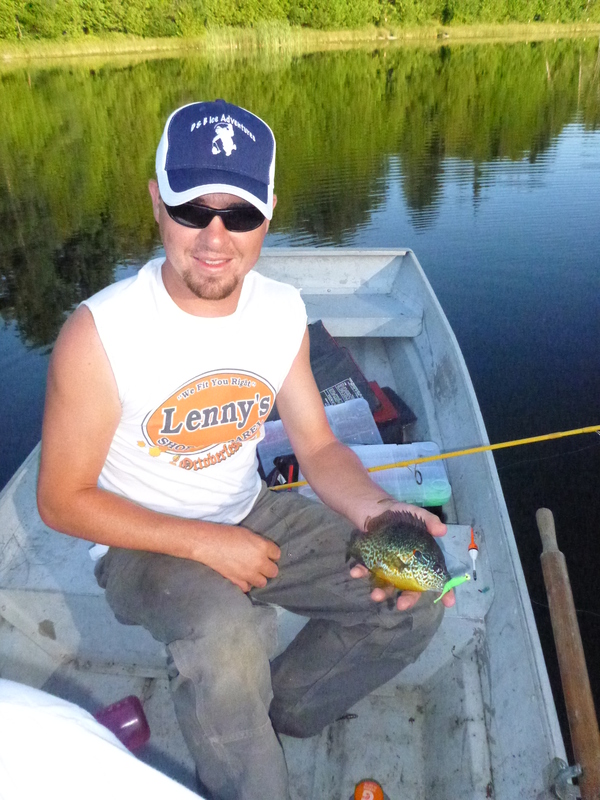 We had no issue catching fish as long as we stayed positioned over the weeds. As we drifted off the structure, we would put the bobbers on and cast until we could no longer reach it with casts then row back up so we could jig them again. This method worked well for the entire trip and we found other similar spots on the pond. 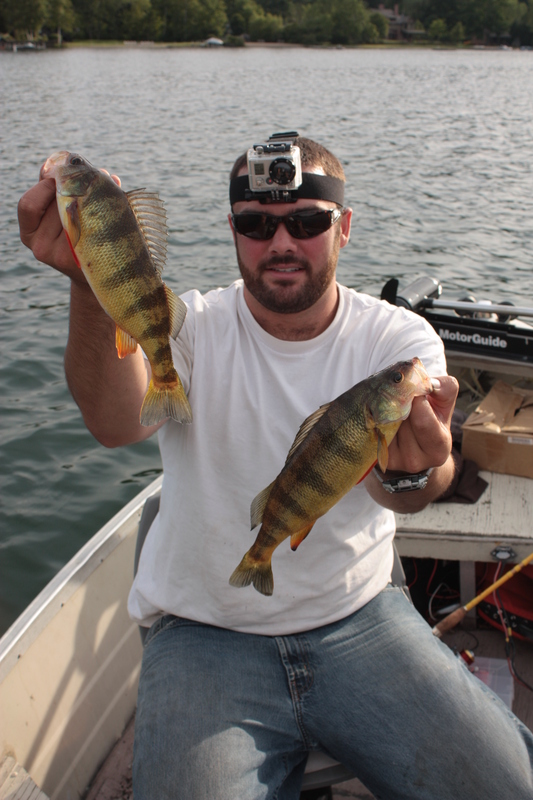 Check out Vertical Jigging Perch And Pumpkinseed on our YouTube Page. 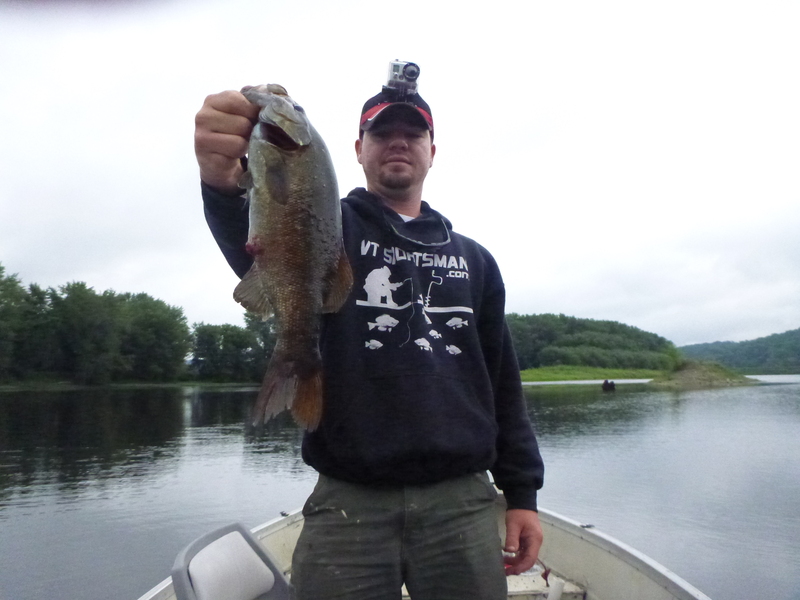 I have spent a lot of time fishing smallmouth on the lake that my family camp is on. Throughout the years I have found some great spots that normally produce quality fish with the right approach. Depending on the season and current conditions, I usually know where to start each trip. Pre-spawn, I fish slow and deep where steep rocky drops are nearby. During the spawn you will find me pounding the shores and slightly deeper gravel bars. Post spawn, I will be drifting over rock flats with a fly or shallow diving crankbait. Throughout the summer it is very common to see me spending the majority of the day with my bait on structure at all depths. For about a two week period in late July you will find me fishing the main part the lake when the smallmouth are chasing pods of perch on a 12-15 foot mud flat. 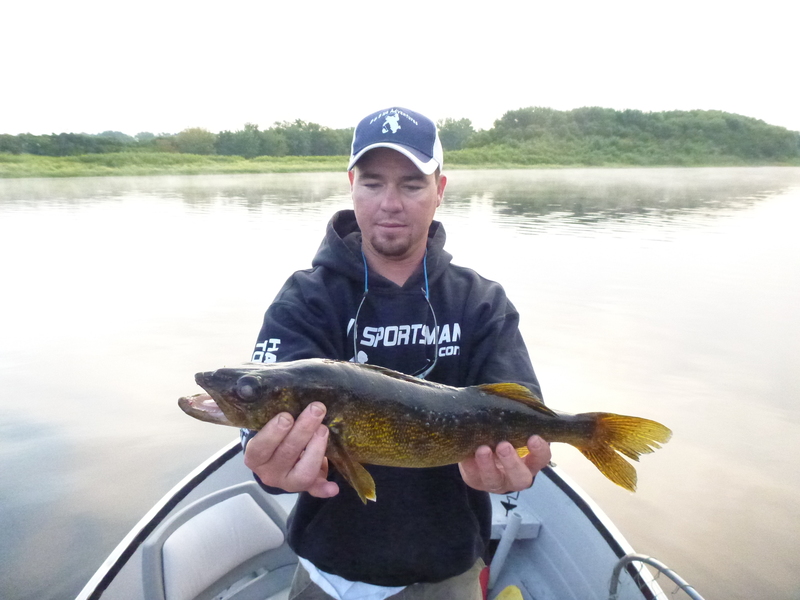 In the fall I head back onto rocky points and shallow structure where I move my baits fast. This system has worked for me for as long as I can remember. I spent this past week at my camp hoping to take advantage of the bass as they cruised the mud flats. The weather has been right and as I started my first night out on the lake I thought I would be in luck. 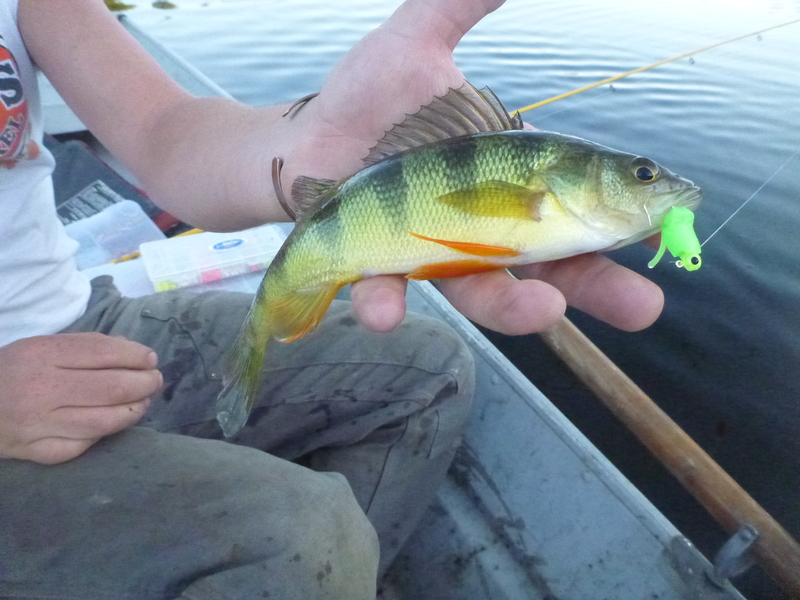 My first few casts yielded some nice sized perch. I figured I’d come out in the morning and find the bass hot on their tails. Knowing the perch were there I started cruising the lake using the Humminbird 998c SI to find structure that I never knew existed. The majority of what I found was already on my radar from years of fishing the lake but I located a few large, isolated boulders that I took some time and posted up on. After switching my sonar to “switchfire” mode, I began vertically jigging a 2″ piece of a pumpkin senko on a 1/4 ounce jig head. 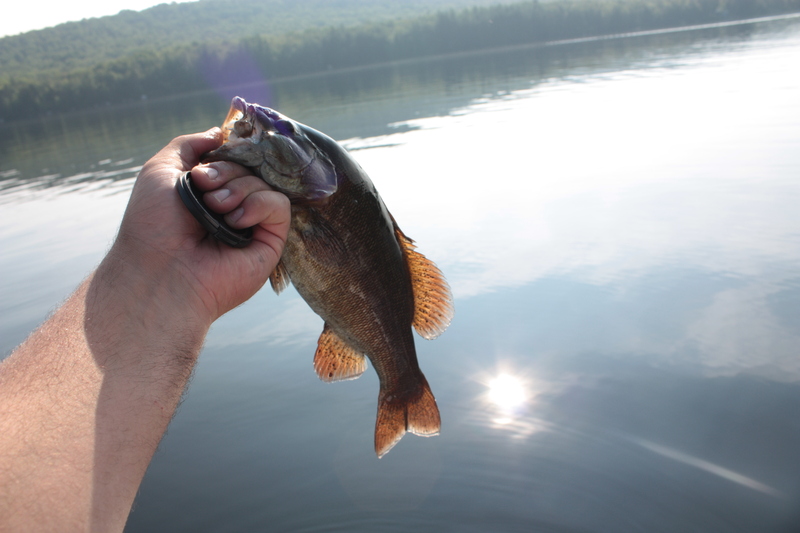 I was able to catch five decent bass in five places on the lake that I had never caught fish before. Other than the boulders I located large humps, old logs from when the area was heavily logged, and some deep weeds in the broad lake. I see good potential for many new spots! With the Humminbird 998c SI hooked onto the boat, we hit the Connecticut River to see what the walleye were holding on underwater. We knew that the timber was a key feature but what caused them to hold more concentrated on one area more than another is what keeps us excited to fish every chance we get! To start the day, we cruised around a good chunk of the river to get a handle on what makes up the area we fish. We found quite a bit of timber with a downstream oriented lean. The logs were stacked one right after another making it very clear as to why we lose so many jigs! If the SI/DI unit could pick up the lures the whole bottom would glow! 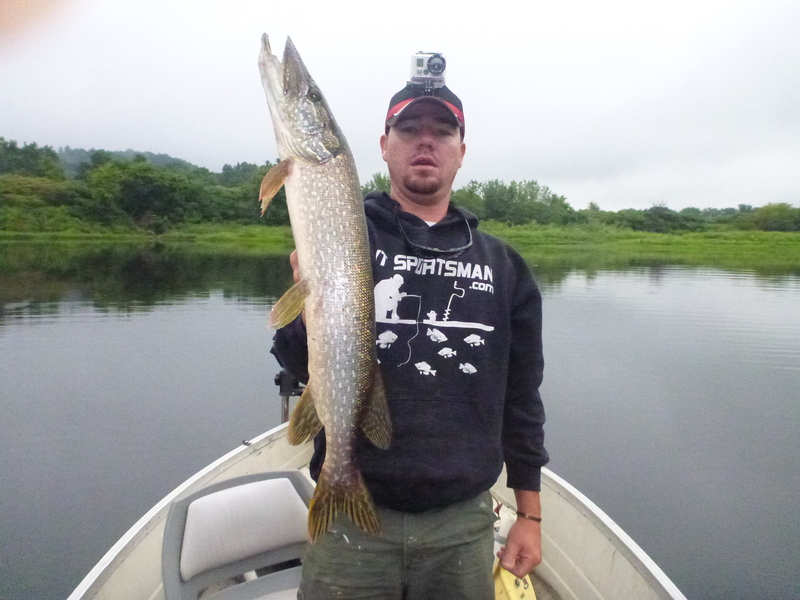 As usual, we were jigging crawlers on a 1/4 ounce lead head. With little rain lately, the water on the Connecticut River was not running high nor were the hydro dams pulling water. When the current is faster, it’s best not to fish but if we do we upgrade our jigs to either a 3/8 or 1/2 ounce weight. 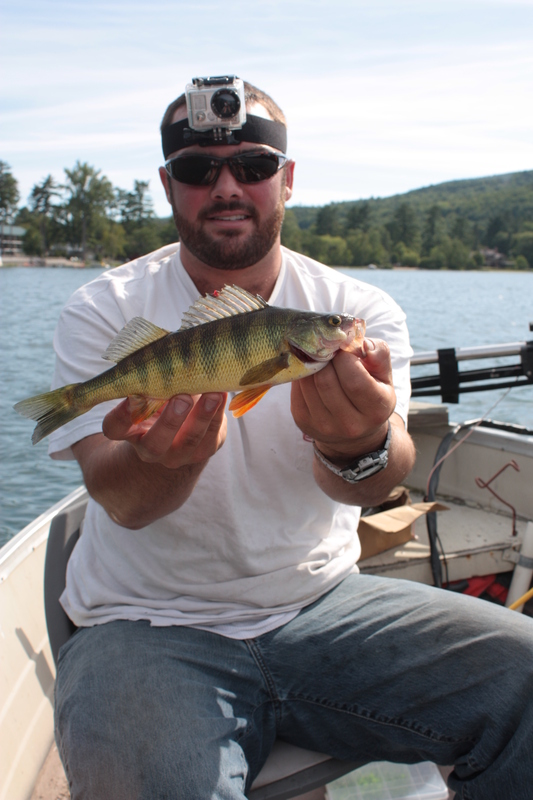 The currents make vertical jigging nearly impossible because as your line drops it gets entwined in the logs. With a faster current, trolling parallel and as close as possible to the log jams would be your best bet. Though the water conditions were ideal, the fishing was not. 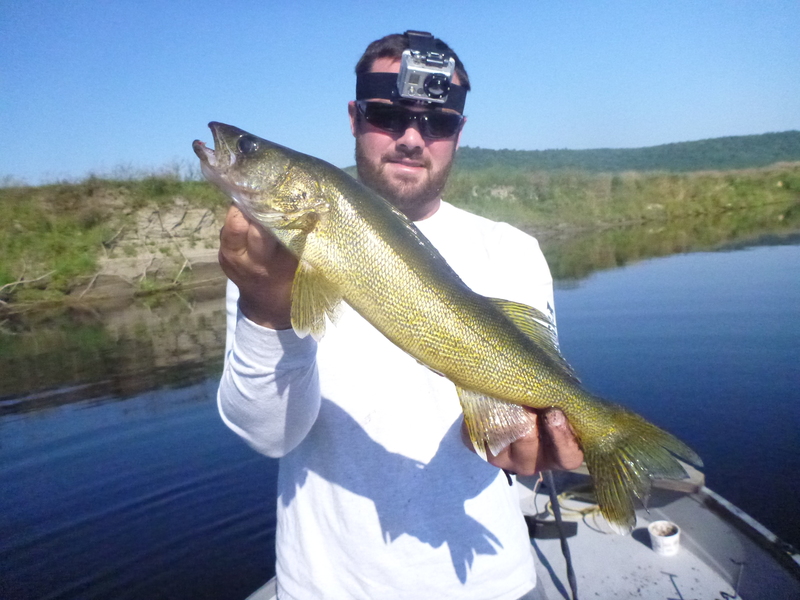 We caught half a dozen walleye, one of which was over the slot, one was in the slot and the rest were under. We took a few smaller eaters for the table that night. 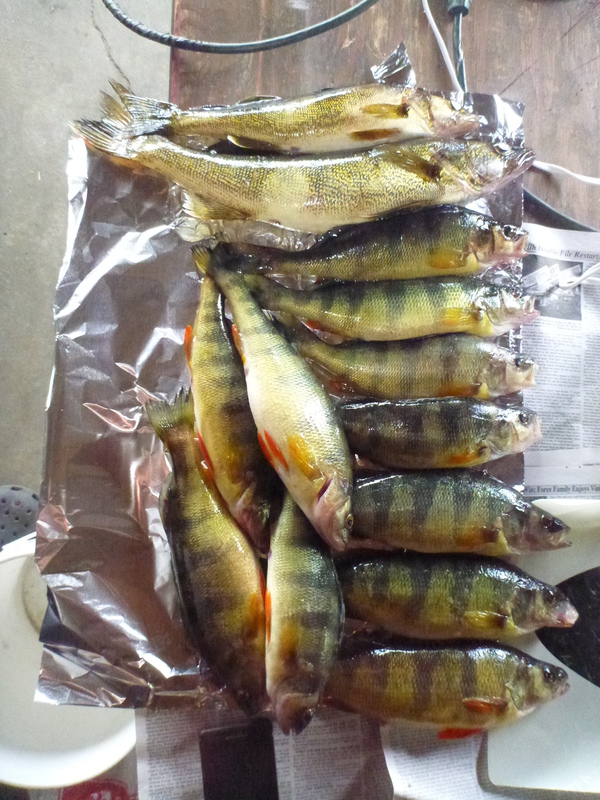 Even though the walleye bite was slow, the perch and rockbass were as hungry as usual. They feed so aggressively, it makes me wonder if they just out compete the walleye when the jig drops down. As for what makes these fish hold in certain pockets more than others, it all goes back to having a good ambush location and offers a break from the current. Each trip, we zone in on certain pockets in these log jams are productive. When one produces over and over, its important for us to keep notes on how we fished it. Sometimes we can pull a few from the same spot while others we limit it with one fish. I think sometimes we spook the fish out because we come from the wrong direction or snag a branch on the way up. Check out Vertical Jigging The Connecticut River on our YouTube Page. With a few hours of freedom from the grind, we got out on the water for an eventful evening. The lake was calm with the exception of boaters. We had high sun with temps in the mid 70’s and best of all, tonight we had our first opportunity to test out a Humminbird 998c SI. With no prior experience with the unit the learning curve was steep. We started off the evening by motoring around a good portion of the perimeter looking for structure previously unknown to us. 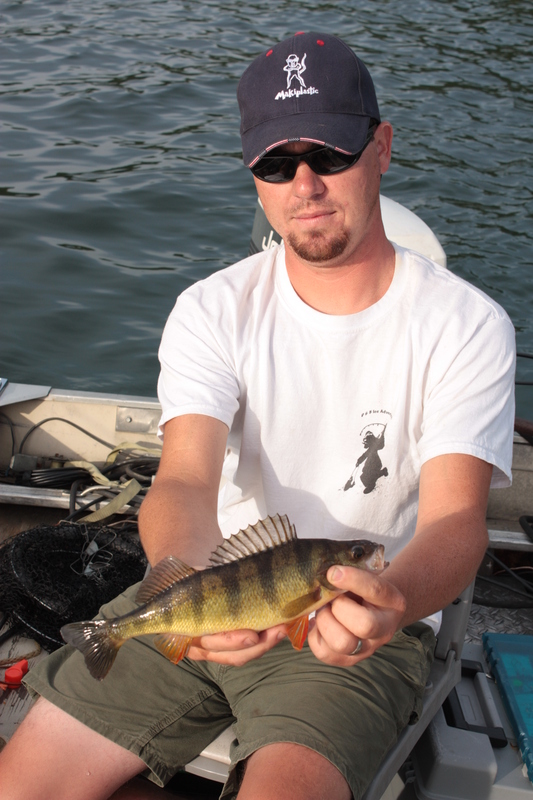 We thought if there was any, the perch roaming the deep basin might relate to it. Unfortunately this was not the case. We struck out twice with our hopes. We found no perch relating to structure mainly because there was no structure! Using the side imaging and down imaging simultaneously, we were able to locate a good pod of fish in an area that we have had success recently. After noting what fish, as well as other features, looked like on the unit, we dropped a line. It didn’t take long for us to start catching fish. We were using two different presentations. The first was a 1/4 ounce jig head from 2 Jerk Baits tipped with a piece of night crawler and the second was the same jig head tipped with a “star light black blue/chartreuse tail” Charlie Brewer Crappie Slider. At times we would tip the slider with a smaller piece of crawler but I don’t think it made much of a difference either way. For a jig color we found bright was best. Blaze orange, hot pink, and yellow chartreuse were the main colors. With the wind not moving us around, we fought with the waves from other motor boats in hopes to stay true on our drift over the school. It became apparent quickly if we missed or hit the school. We didn’t have to jig much. Mainly, the slight drift as well as attention to slack in our line kept us off the bottom and in the feeding zone for these perch. We found them to be between 6″ to 2 feet off the bottom. We caught the majority of our fish between 20 – 25′ and we knew our drift was over when we hit the green slime line. Our jigs would start “pulling” not “thumping”and you could barely see your jig when you got it to the boat! Our day ended as the sun hit the trees. We couldn’t buy a bite so we packed up and hit the road. Check out Deep Water Perch on our YouTube page. 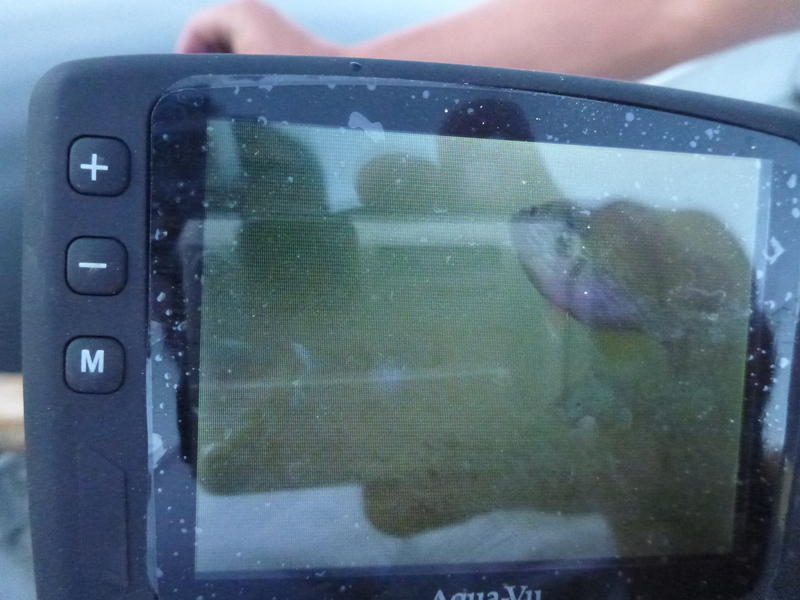 We will work on getting some images off the Humminbird as soon as we get a better grasp on it!